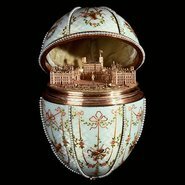 The reign of Peter the Great (1682 – 1721) and later, that of Catherine the Great (1762-1796) brought different influences to the Russian decorative arts. Peter the Great travelled to the Netherlands to learn ship-building & clock-making, returning to set up a Kunstkamera of mainly natural history collecting but also funded for Russian artists to travel to Europe. Catherine the Great also encouraged the arts, using it to establish Russian cultural status in Europe, with the elegance and beauty of the Winter Palace, collecting porcelain, silver, jewellery, furniture and tapestries.